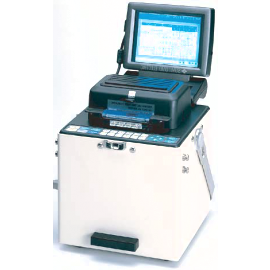 The Type-36 is one of the smallest and fastest core alignment fusion splicers available today. It’s a portable, fully automatic, self-contained instrument for creating low-loss optical fiber splices in both field and factory environments. Sumitomo’s innovative dual microscope fiber observation system eliminates the need for mirrors, providing faster operation and reduced damage potential. It is designed to work with a variety of fiber types including single-mode, multimode, dispersion shifted, and other specialty fiber. Type-36 is the only fusion splicer in the industry offering an optional modem for splicer remote interactive maintenance (S-RIM). HDCM (High-resolution Direct Core Monitoring) image processing software in the splicer is used to perform core alignment and estimates the splice loss. The splicer automatically aligns a pair of fibers in both the X and Y (horizontal and vertical) planes and then fuses them together with heat from an electric arc to form a low-loss splice.